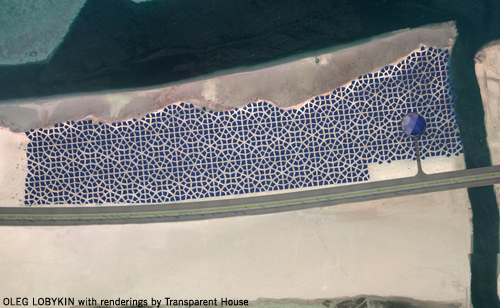 Solaris is a sculptural art installation comprised of hundreds of photovoltaic panels arranged in the pattern of a familiar cultural ornamental. 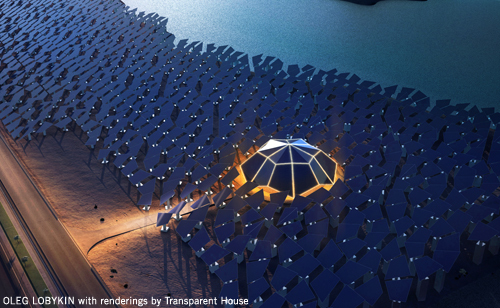 This approach combines the benefits of modern technology for producing solar energy as electricity with a visual representation of traditional images having cultural significance. Due to its size and proximity to the airport, the site offers an opportunity to showcase a design from an aerial vantage point that is quite distinctive and provides an attractive alternative to a strictly utilitarian configuration of panels in flat straight rows. From an aesthetic perspective, this approach offers several benefits. Panels may be manufactured in a handful of different geometric shapes, such as triangular and rhomboid, and then arranged in a virtually unlimited number of configurations to create customized patterns of design. This versatility allows the concept to be replicated in various locations with minimal cost for customization, straightforward and scalable manufacturing and installation, and site-specific design specifications for pattern development. From an environmental perspective, solar power is a renewable resource that is ideally suited to the site. Sunlight is plentiful throughout the year, and because the site is already mostly devoid of vegetation a photovoltaic installation would add to the renewable power base without posing any significant risk to existing flora and fauna. 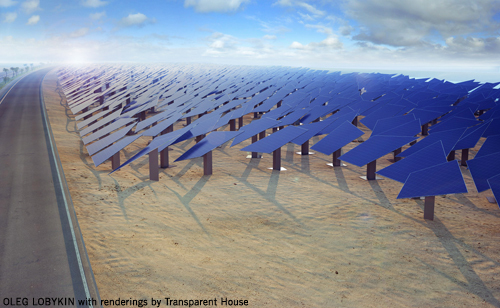 Solaris will contain 1,418 photovoltaic (PV) panels and will have a peak capacity of 45 MW. This amount will be sufficient not only to provide for the ongoing energy needs of the site itself, including an interactive visitor center, but also for other commercial or residential buildings in the area. 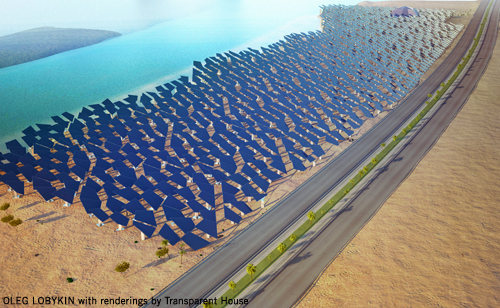 On the side nearest the coast, the PV panels will be arranged along the coastline itself. They will integrate the design seamlessly into its environment and also mark the contour of the coastline at a particular point in time so that any future changes in it will be easily visible. In addition, there is 25m high dome structure integrated into the design which can serve as a visitor center and environmental science interactive museum that collects and presents information about the effects of climate change around the world. Multi-media exhibits could connect viewers in real time to events occurring in particular places on the planet, such as rainforests, glaciers, oceans, etc. and act as a historical record of changes over time. The name “Solaris” is taken from the novel of the same name published in 1961 by Stanislaw Lem. The novel depicts the relationship between people of the future and “the rational ocean”, which the artist sees as a metaphor for nature itself. The issue at hand is the coexistence of human beings and the natural environment.